On March 12th (I know I'm so backdated with my entries! Please bear with me! 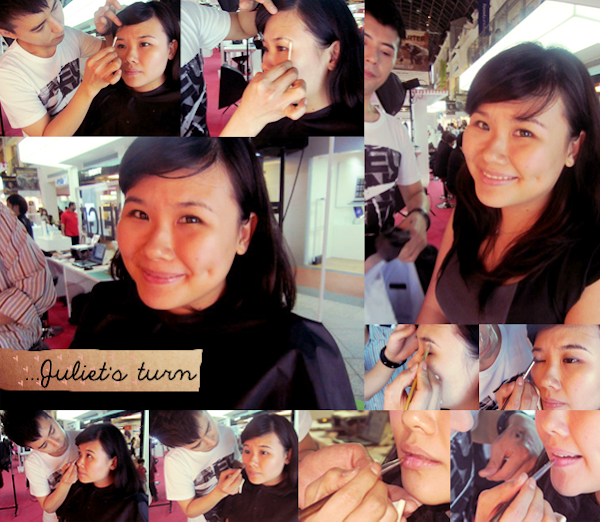 ), I attended the 'Laneíge's Love in Bloom Alluring Beauty Makeover' with dear Juliet! The event was held at the atrium of Bugis Junction and was a collaboration between Laneíge and BHG Bugis for the annual Makeup and Beauty Fest. This time round, Laneíge actually invited Romeo Eun, who's the senior makeup trainer from the brand's parent company, Amorepacific. Thus, Juliet got the cute puppy look and she went first! The first thing that Romeo did was to touch up her eyebrows. He used concealer to 'alter' the shapes of her eyebrows. For her look, the key thing is to go 'round'! 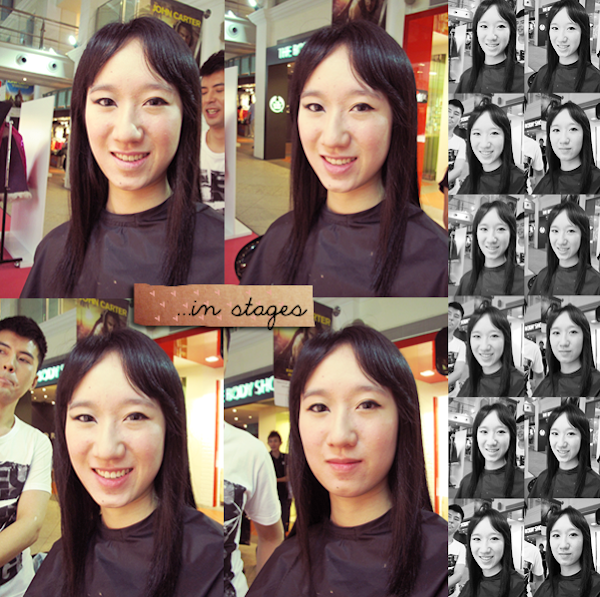 Eyeshadows and blusher were applied in a circular manner. And the eyeliner was drawn thicker in the center to create big and round doll-like eyes. Romeo did one side of Juliet's face first and gosh! Look at her eyes! What a difference a few strokes made! It was really interesting for both Juliet and I because it was the very first time that we saw eyeshadows being applied in a circular manner! And then, it was my turn to morph into a kitty! Haha. Again, the first thing Romeo did was to trim my eyebrows (I haven't done anything professional to them since... Forever. Haha. It's just to expensive to upkeep. I just pluck away the stray ones. And besides, my fringe is always all over my face so no one actually sees them. Only parts here and there. Haha.). He suggested using a shaver to keep the area clean (But hmmm... My Browhaus therapist told me that shaving would cause ingrowns?!?). He drew my eyebrows down towards my nose so that the arches would be more distinct. The kitty look meant that almost everything was to be applied at an angle! For the eyeliner, he drew the bottom first. By drawing the bottom, you can draw the winged liner at the 'right' angle. He also drew the inner corners of my eyes to make them seemingly larger. As my cheekbones are invisible, he advised me to apply my blusher from my hairline down, diagonally. 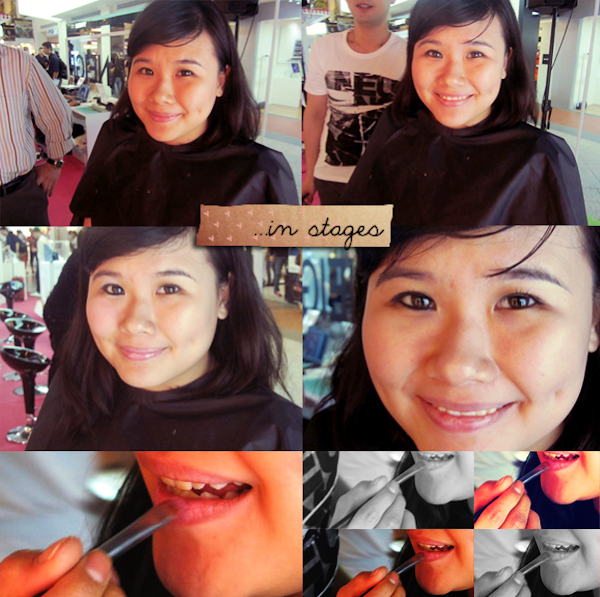 He then applied highlighter right above the blusher, from the cheeks outwards. But anyway! TADAHHH!!! Here's my face, half-done!!! And TADAHHH again! Both sides done! Posing in front of the stage! Romeo and us! (His skin was glistening a little under the harsh fluorescent lights. But flawless, I tell you! The pose which Romeo suggested!!! Hahaha!!! Please mentally erase the bad skin. My skin was recovering from the drought then and it still is (Much, much better now though!). Still, SIGH!!! A close-up of my eye! And last but not least, here are some of my thoughts. Blogging is no easy business. Especially when I try to strive for perfection in every post and I have school and my family and friends... I get very jaded at times. After pictorial posts (Some which have taken more than ten hours to do. ), all I want to do is lie down on my bed and stare at the ceiling. But I can't because I have to work on my school homework (HAHAHA. Yes, I actually place blogging in front of schoolwork. Though that has to change soon. REAL soon. Exams are in April! ).